New (April 17th, 2019): We are excited to announce that the ASPIRE program will host two, five day sessions in the summer of 2019! 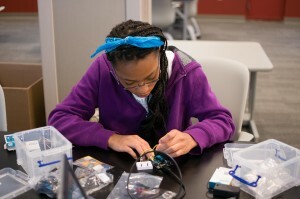 Session 1 will be June 3rd-7th, and Session 2 will be June 10th-14th, from 9 am to 5 pm each day in the Physics Research Building at Ohio State. The program only takes place during the day and overnight accommodations are not expected or included. Applications can be submitted here. Applications for both sessions are due May 22nd. 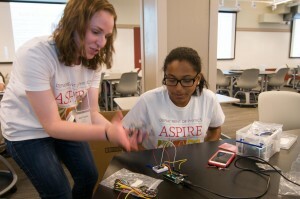 The ASPIRE workshop is for high school women who are entering the 10th, 11th or 12th grades. 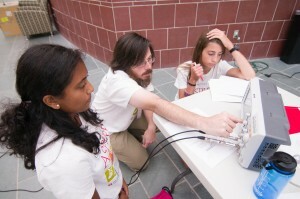 Participants will get their hands on physics equipment and software used by physicists and learn about physics research. 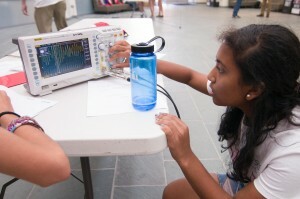 In last year’s ASPIRE workshop, participants worked on three separate radio-themed projects where they searched for a hidden transmitter using antennas and oscilloscopes, analyzed real data from the ANITA neutrino experiment in Mathematica, and programmed an Arduino to produce their own mini-radio station. Physicists from all levels—undergraduate, graduate, post-doctoral, and professor—come together to share their knowledge, expertise, and enthusiasm with workshop attendees. Together, we foster the next generation of women scientists by giving them exposure to real research environments, challenges, and rewards. It is not expected that participants have any physics or mathematics background and thus there are no previous course requirements for the workshop. However, we have noticed that students have a more constructive experience if they have taken trigonometry and possibly some exposure to physics in the classroom. There is a $50 fee for participation in the workshop. If this fee is overly burdensome, scholarships are available. Please contact the coordinator (medina.101@osu.edu) for more information. ASPIRE is made possible by generous support of the National Science Foundation through NSF CAREER Award 1255557, the Center for Cosmology and Astroparticle Physics (CCAPP), and the Department of Physics at The Ohio State University. Hi. What is the application date for the second session? March 31 is for the early June session, correct? The deadline for the June workshop has been extended to April 15th I believe (my coordinator is out right now but I will check with him when he gets back and make sure it is updated). The deadline for the August workshop has not been set yet but if you are interested you could apply now. Hi! When my daughter and I spoke to the representatives of your program they mentioned that there was another program for middle school girls. It might be in the astronomy department. Would you be able to direct us to who we should talk to about signing her up for that camp? Thank you!! I am sorry that we did not see this message but it is a day program. We plan on having the program again next year pending funding. Are Session 1 and Session 2 the same? Or do they have to participate in Session 1 in order to take Session 2? Sorry that we did not see this message before but both sessions are the same, we just offer it twice. We plan to hold the workshop again next year pending funding, so you can check back to this site. Hi, are there any requirements regarding previous experience with or classes taken in physics? Sorry that we missed this message. There are no previous requirements, having some trigonometry helps but if they have not seen it we teach them what they need to know for the projects. 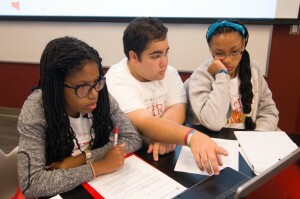 We also group them with participants with similar math backgrounds. Thank you for your interest, we plan to hold ASPIRE workshops again next year pending funding, so you can check this site in the spring. Hello. I will have a rising Junior this summer and she is interested in this camp. Will you be holding sessions in 2018, or was this just a camp for last year? Sorry for the delay in the response. The web page has been updated with new information for the 2018 summer sessions. The first workshop will be August 6-10 and the second one will be August 13-17. Please let us know if you have any other questions! Hello, will this program be held for summer 2018? Sorry for the delayed response. Yes, this program will be held for the summer of 2018. The two sessions will be August 6-10 and August 13-17. Please let us know if you have any other questions! I know some students who are interested in the 2018 program. Would appreciate any details. Sorry for the delayed response. Additional details for the 2018 program are now posted on the website above. Please let us know if you have any additional questions about the program for this summer! Daughter is interested in this workshop. I can’t seem to find any information on whether there is a cost to the camp. So I was wondering what is the cost of the camp and if so are scholarships available? 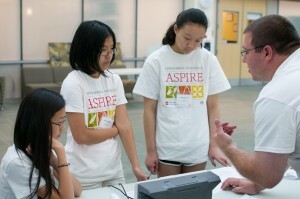 Thanks for your interest in the ASPIRE workshop. The cost for the camp is still being worked out for this year. The cost is used to cover the cost of food, transportation, and consumable supplies for the participants. However, we have made it a policy to provide financial support for those who find the cost burdensome. Once the cost is worked out, it will be posted on the website and I will additionally respond in a further comment.